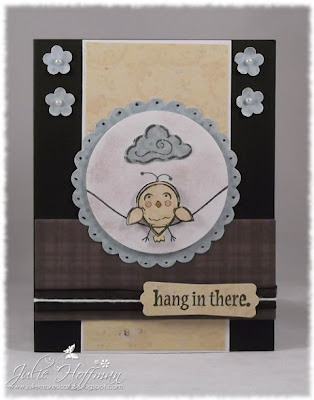 I'm here today with a card for this week's Paper Players Sketch Challenge PP101. I chose this color scheme based on the theme of the card. These aren't my typical colors but I really like the contrast of the soft blue and yellow against the grey and black. I sponged some silver on the white circle. The bird and cloud are paper pieced. The most meaningful card I ever got was from my twin sister. When I was going through a really rough time, my sister gave me a card with an adorable kitten hanging from a tree with the sentiment - hang in there. I'll never forget that card because it meant so much to me that she cared so much for what I was going through. I still have that card 15 years later. That's why I LOVE this stamp set so much. It means a lot when you can send someone a card of encouragement when they really need it. Thanks for stopping by and checking out my card today! I can't color to save my life! Great job on the card. One day I am going to try out the paper players, do they ever have non sketch challenges? I stink at sketches too. What an adorable card! This would bring a smile to anyone's face! Thanks for playing with The Paper Players! Sweet and adorable. I like your post about why you made this card. A sis is there at just the right time and knows just what you need. I think this card will do the same for someone else. Super cute!! Have you by any chance read the latest Happy Hour post at CAS-ual Fridays? Have a great day!